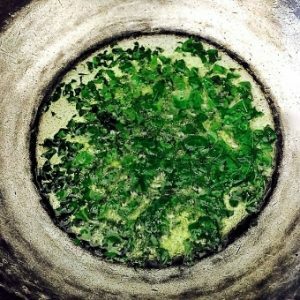 A new post and a Cook Book Review! 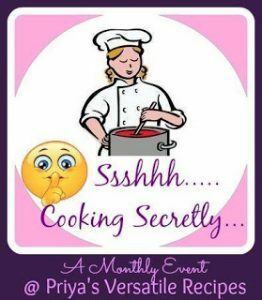 Its time for this month’s post for the Shh Cooking Secretly Challenge Group (more about the group, later on). 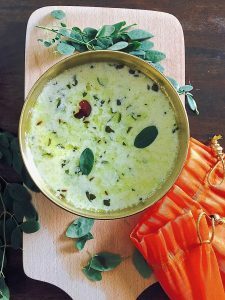 With Kerala as the theme for September, there was such a wide variety of recipes to choose from. 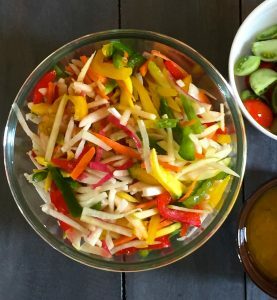 I had two ingredients to work with, coconut and cumin, and this gave me so much scope! Browsing my cookbooks for Kerala dishes with ingredients that I did not often use, I came across the Erissery that could be made from a variety of vegetables. Raw Banana Varutha Erissery was the final choice for the theme, and I hope you love it as much as I did. 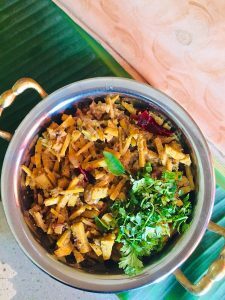 Its easy, its simple and the addition of roasted grated coconut gives an amazing flavour that glamourises the humble raw banana or green plantain. 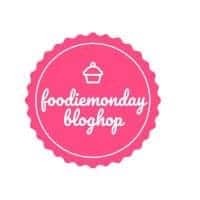 Those of you who are following the recent posts on this blog would have seen the references to the Facebook Food Bloggers Group of which I am a member, viz Shhhhh Cooking Secretly Challenge , which has got us cooking from the varied cuisines of the States of India. Working our way alphabetically, we have reached Karnataka, the beautiful State which is now my home. 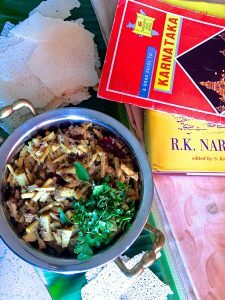 From my experiences with this theme over the last few months, it was no surprise to find that there is no one Karnataka cuisine, but that each region of the State celebrates its ethnicity with its own favourite foods and its special methods of preparation. 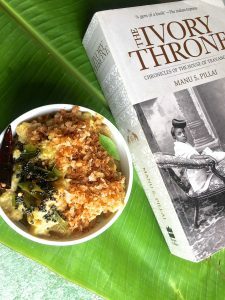 The Bamboo Shoot Curry that I selected as my contribution to August 2018’s rich theme is one such recipe, popular in Coorg or Kodagu and in Mangalore. My partner for the month is Priya Iyer. Priya and I had a lengthy discussion on what ingredients to pick. Both of us wanted to cook with something special or unique to Karnataka. Priya suggested I used Bamboo Shoots and coconut as the two ‘secret’ ingredients which the members of the group would have to guess, once I posted the image of the dish on our group. The bamboo shoot curry was the result of this discussion. Priya blogs at The Girl Next Door. Please visit her blog to see the well written recipes as well as her interesting notes on the exotic places she has travelled to. 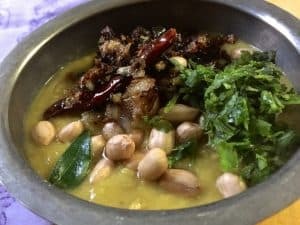 I suggested two ingredients for Priya, urad dhal and ginger so that she would have the options to select the main ingredients for the recipe. 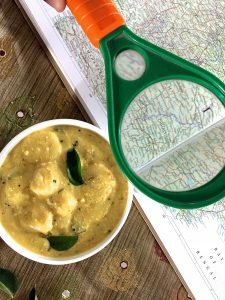 Have a look at this Karnataka Bonda Soup that she has prepared! It looks so delicious and easy to make too! Preparing the Bamboo Shoot Curry (also known as Kalale, Kanile or Baimbale Kari) needs some patience, though it is not difficult. The actual curry is easy to make, while the preparation of the shoots for cooking can be a stumbling block if you have not used them as an ingredient before. In the recipe below I have tried to make this simple with step by step directions. Bamboo shoots are known to have a toxic content, and fermenting or boiling is carried out to expel the toxins as well as remove the bitter taste of the raw shoots. The fresh bamboo shoots have a tough husk which can be peeled off without difficulty, and the bamboo sliced as required. 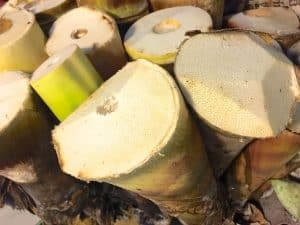 I was lucky to find an online store, OnlineMangaloreStore which delivered the bamboo to my residence, already peeled and sliced into thick rounds. I then soaked for 72 hours as explained in the instructions below. Most recipes suggest that 48 hours of soaking should do, but after some research I decided to soak the shoots for an extra day before I sliced them into thin matchsticks and boiled them with turmeric. The online store was interesting, I was able to pick up quite a few items which I would normally have to scour the Mangalore Stores around for. I plan to get Breadfruit from them and try a curry out of that too. My friends Kevin and Anirudh had dropped in the day the Bamboo Shoot Curry was made, and as Kevin is from Mangalore and a devoted foodie as well as being no stranger to the kitchen, I requested him to taste it. He felt that it lacked a certain tartness or sourness and suggested the addition of tamarind. I have to say it lifted the curry up a notch and has therefore found its way into the final recipe. Coming to the food of Coorg, the cuisine is based on locally available ingredients and though new vegetable types have crept in, the popular traditional food comprises rice based dishes such as otti, nooputtu, kadumbuttu, and plain rice accompanied by rich curries made of pork, mutton or chicken and a variety of vegetable based curries such as bamboo shoot curry and those made using jackfruit, mushrooms, colocasia leaves, breadfruit and banana, depending on seasonal availability. Meat based recipes predominate. I realised while reading up on the food here that it has ingredients more in common with India’s North East than any other part of the country. The Bamboo shoot curry for example, though prepared a little differently from the same in Assam, Nagaland, Manipur, Sikkim etc, is rarely found on the dining table in other parts of India. A childhood favourite, I loved the Paruppu Usili made by my Mom – she would make it with banana flower (vazhaipoo) or guar / cluster beans (kothavarangai). I had attempted to make the this curry once or twice but was not happy with the results. Now that my daughter Mridula wanted a recipe for an authentic paruppu usili, I decided to make it once more. This time I researched the various steps for making the curry. 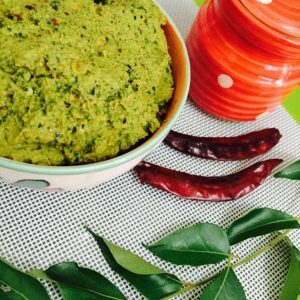 Meenakshi Ammal’s Samaithu Par or Cook and See cookbook, Vol 1, has the recipe for the Plantain Flower Dhal Paste Curry, and for the Cluster Beans Dhal Paste Curry. I have modified the recipe quite a bit, following what I recollected of the process my mother used. The Paruppu Usili is a simple dry curry which goes well with a kuzhambu such as a vathal kuzhambu (which I prepared today for lunch) or with sambar, milagu kozhambu or mor kuzhambu. It tastes good with rasam too. 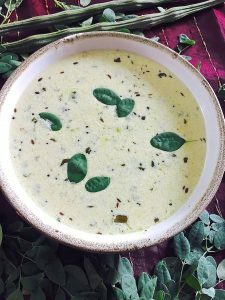 In fact you can have this curry with just about any South Indian style gravy (kuzhambu or rasam) or with chappaties and dhal. The Cook and See book suggests that the vegetable be cooked with water on the stove top. I prefer to steam the sliced vegetables. All you need is for the vegetables to be cooked well with a bite still remaining and not overcooked and soggy, and for the dhal paste to have the right consistency. Again, the cookbook does not suggest steaming the dhal paste, but I have seen my mother steaming it, and I preferred the dhal to be well cooked, so I have also steamed the dhal after grinding it to a paste. I saved time by steaming the cluster bean slices and the dhal paste in the steamer container in my pasta cooker. Both need about the same amount of time so this was convenient. You will need 10 minutes after the water begins to boil, for the vegetables to cook. An idli plate kept in the idli cooker/ pressure cooker, with adequate water for 10 minutes of steaming, and without the weight on the cooker lid, could be used. Alternatively, steam the paste and the vegetables on a plate fitted into a kadai or frying pan, again with sufficient water for steaming for about 10 minutes(from the time the water begins to boil). After steaming the dhal paste, allow it to cool and then crumble it with your hand, as it would have caked after steaming. Crumbling will help stir it nicely into the cooked vegetables and the tempering. This is a dry curry and moisture would impact the consistency and taste. Squeeze out any excess water from the cooked beans. Also, grind the dhal -chilli paste without adding water to it. Select young tender cluster beans as more mature ones tend to be stringy, fibrous and bitter. The plantain flower paruppu usili is very tasty, but the process of removing the stamen from each little flower and then slicing the sticky blossoms is a little time consuming. Making paruppu usili with cluster beans, French beans, snake gourd, raw plantain (raw banana) cabbage or yam, is easier and faster. Lunch today is something I am looking forward to: kotavarangai paruppu usili, orange peel vathal kuzhambu (again my mother’s recipe) and hot rice with potato chips! The paruppu usili tastes real good. Im wondering whether I can make a quesadilla with some of it. With a yogurt dip as an accompaniment. Will let you know how that goes! 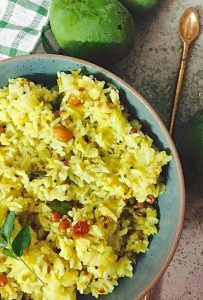 A fragrant traditional rice dish from Eastern Uttar Pradesh in India, Matar ki Tehri – made with seasonal Green peas cooked with Basmati rice, subtly spiced and flavoured with Desi Ghee. Having married into a family from Eastern UP, I’ve been making my own version of Vegetable Tehri and Matar ki tehri, for many years. 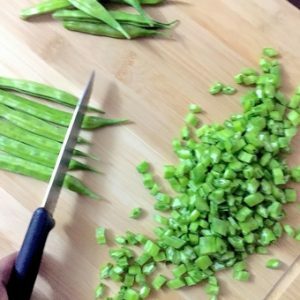 However when I wanted an authentic recipe for Tehri, I turned to my sister in law Kusum Dutt for these step by step instructions. As Kusum explained, there are two versions of Tehri: one is made with potato, carrot and cauliflower and using haldi (turmeric) and the other is the one I’m relating here, that is made with green peas and where turmeric is not added. 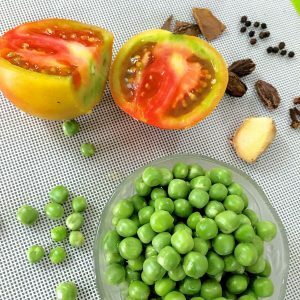 With peas being plentifully available now, this is a great one pot easy to make dish. 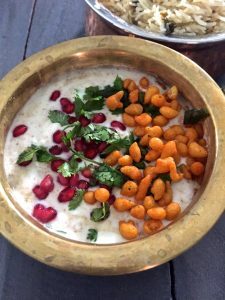 Serve the Tehri with a simple boondi raita and with marinated and fried slices of eggplant. 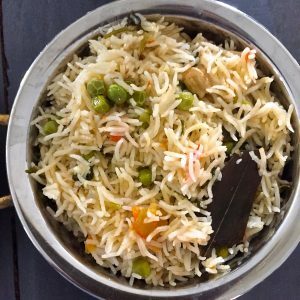 I have made the Matar ki Tehri in a pressure cooker, but a thick bottomed pan would be good too, though you need to check that the rice doesn’t ‘catch’ at the bottom of the pan. Be sure to use Basmati Rice and Desi Ghee, it makes all the difference to the flavour. The aroma wafting through the house as you cook, is a reward by itself. For a vegan version, substitute a mild flavoured vegetable oil (olive oil or sunflower oil) for the Ghee, and reduce the quantity of oil to 1 tablespoon. Use whole spices, fresh coriander leaves and equal volumes of raw rice and peas, to get that ‘authentic’ taste. Spices of good quality will add to the flavour and aroma. It’s the time of the year when vegetable shops abundantly display gourds of all shapes and sizes. Make tasty dishes from these unpromising but highly nutritious vegetables. Tori/ Turai/ Peerkangai is high in fibre content, low in saturated fat and cholesterol. 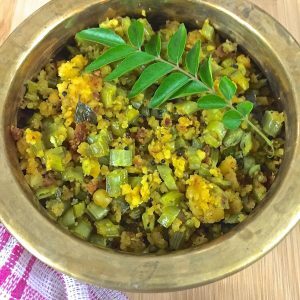 The Ridge Gourd Peanut Chutney or Peerkangai Thogaiyal, is easy to make and tastes really good too.